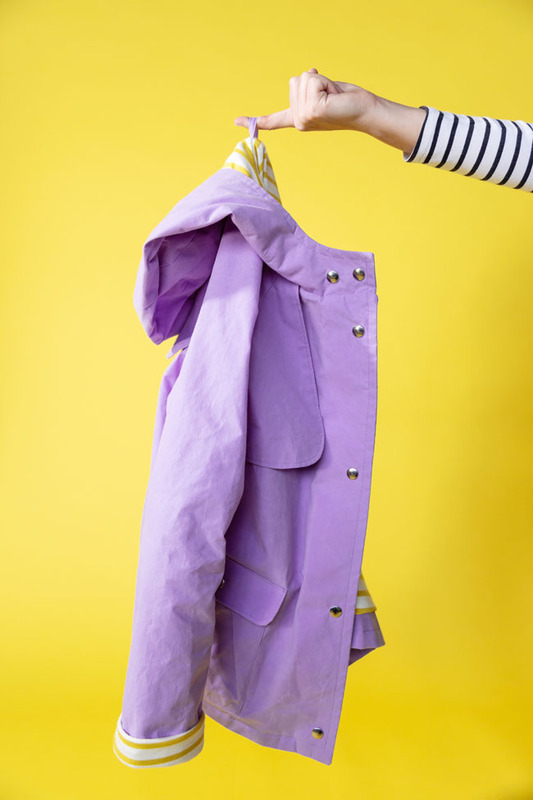 Want to get stuck into sewing a raincoat? There are more and more amazing water repellent fabrics coming onto the market for home sewists to get the hands on. 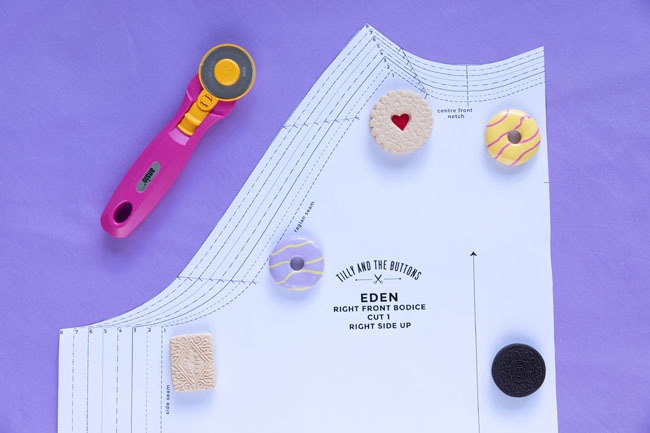 And our Eden coat sewing pattern is the perfect accompaniment, taking you through the steps to making a gorgeous raincoat or jacket. If you’ve never sewn with waterproof or water repellent fabrics before, here are some tips on what to look out for, how to handle the materials, and stitching tips to get a great result. 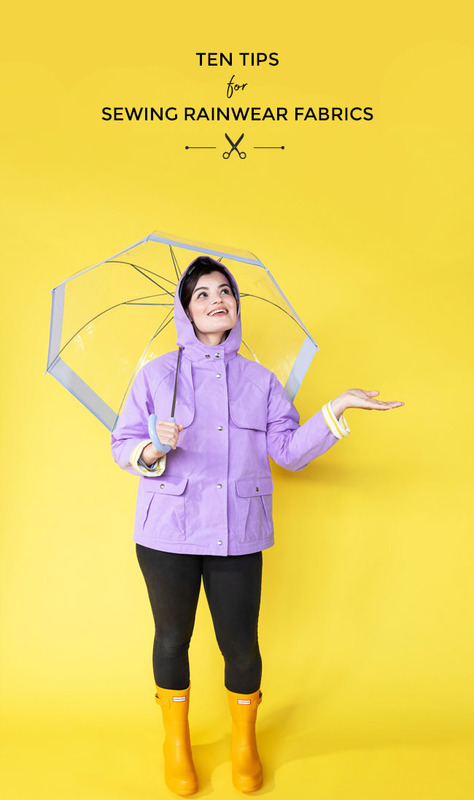 There are lots of different types of rainwear fabrics on the market, and more and more of them are becoming available to home sewists to buy. Which is great! However, be aware that they can vary wildly in weight, content, feel and how they behave when you cut and sew them. How they perform in the rain will be one of the main factors to consider when choosing what to buy. If you want to sew something that will keep you dry in a full-on downpour, take a look at waterproof fabrics such as PUL and Goretex. They are proper performance fabrics that won’t let rain through the fibres… but on the downside they can feel very synthetic and aren’t breathable – so you may get a little sticky! 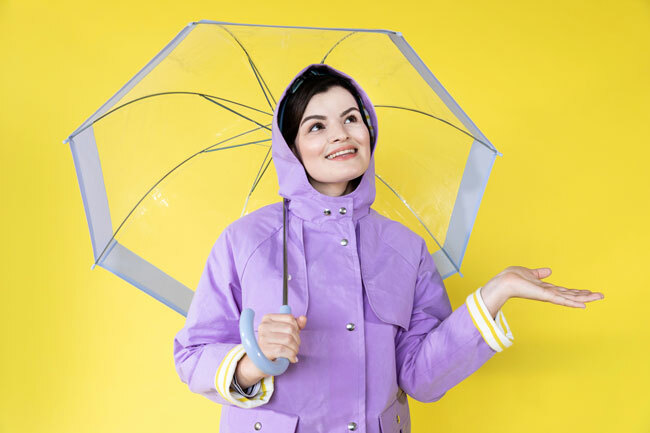 If you’re not planning on wearing your handmade raincoat on a mountaineering expedition and just want something cute that will wear well on a short rainy walk, try a fabric that is “water resistant” or “water repellent” rather than “waterproof”. The waxed cotton in our Eden sewing kits is one such fabric – it may not withstand a tropical storm but will keep the rain off you on your commute to work or a gentle country walk. Knowing what all the different rainwear fabric names mean can certainly feel a little confusing. If you’re buying online and aren’t sure what to get, see if you can order a couple of sample swatches to get a feel for what you like before buying. 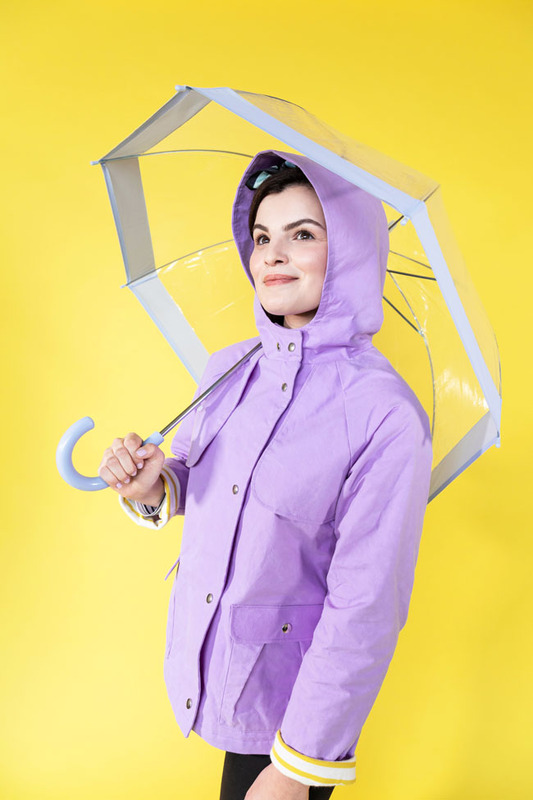 Materials such as waxed cotton can feel stiff, while oilcloth is sticky to the touch, and fabrics such as softshell can be slippery – all properties which can make cutting rainwear a little tricky. Instead of folding it, you may find it easiest to cut the fabric with it laid out as a single layer, the pattern pieces flipped over as necessary to cut a pair or double piece. Pinning through water repellent fabric can create teeny holes which will let water seep through to your clothing, so it’s safer to hold the pattern on the fabric with pattern weights. You don’t need specialist weights – anything flat and heavy you have to hand will do, such as books, tins or washers. To keep the fabric lying flat when weighed down, it’s more accurate to use a rotary cutter rather than scissors. If you need to add markings, you may need to try out a few different tools if your usual marker doesn’t show up. Try a washable pen, chalk or dressmaker’s carbon. If theose don’t work, try scoring the fabric with something sharp like the end or a ruler or tip of your small scissors to create a small mark that doesn’t leave a hole in the fabric. Some water resistant fabrics won’t adhere to fusible interfacing, so test it out on a scrap first. If it won’t stick, you can use sew-in interfacing. Use your hands to smooth the pieces down onto the coat pieces so they’re lying nice and flat, then use dots of glue stick around the edge (within the seam allowance) to hold the pieces in place temporarily before you stitch the pieces together. Whatever interfacing you use, make sure it’s the good quality woven type, rather than the papery stuff which can fall apart, especially when soggy! As mentioned above, pinning might leave holes which could let water through your lovely raincoat. So try using fabric clips to hold the pieces together instead of pins. You can get special fabric clips – or try using regular bulldog clips, or even hairgrips. 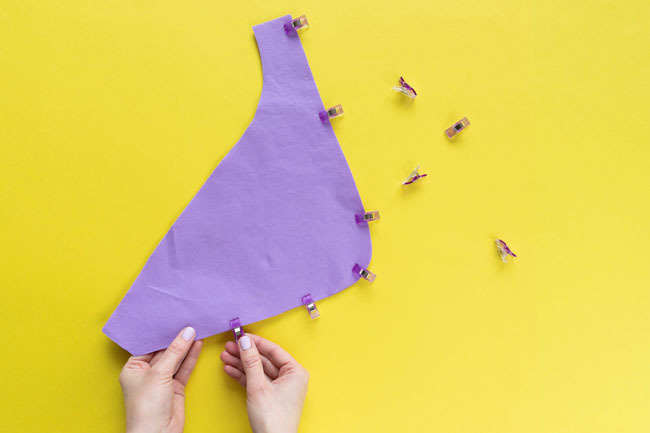 If you don’t have any clips to hand and want to use pins, aim to keep them within the seam allowances so any holes won’t end up on the outside of your garment. If you do end up accidentally pinning the main fabric, don’t worry – try rubbing the hole with your finger or with the little red blob on the end of some seam rippers (yes, that’s what that blob is for!) and, depending on your fabric, the fibres should smooth together again. Magic! Most rainwear fabrics have a tight weave and, as with pinning, you don’t want to leave holes in your seams when sewing them. So use a new, sharp, fine needle, around size 8-10, or try a microtex needle. 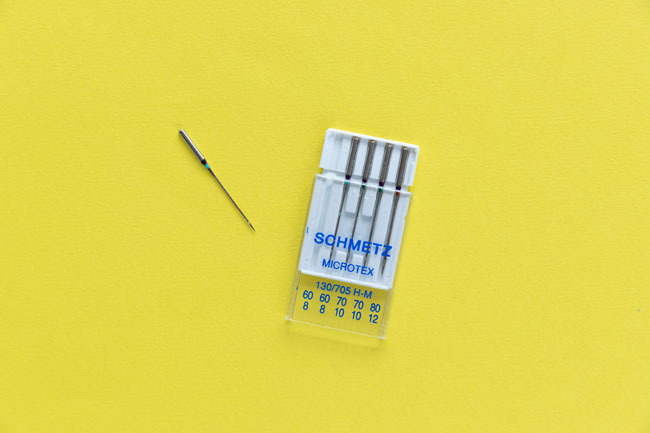 Because the material is a little tricky to puncture, you’ll probably need to change your needle frequently – so have some spares to hand! If you’re sewing with a coated fabric that makes the needle sticky, try cleaning it with rubbing alcohol or nail polish remover. Just check it’s fully evaporated before you start sewing again so it doesn’t damage the fabric. If you’re using a fabric that isn’t coated and you find it’s slipping and sliding around on your sewing machine and/or the seams are rippling as you’re sewing them, try attaching a walking foot – or dual feed foot, depending on the model you have. This will help the machine grip both layers of fabric together and feed them through at the same speed, creating (hopefully!) a nice, smooth seam. If you’re using a coated fabric such as waxed cotton or oilcloth, on the other hand, you may have the opposite problem – the fabric sticking to the presser foot and not feeding through the machine. In which case, consider using a Teflon foot, which is cheap to buy. Alternatively you could sandwich a layer of tissue paper between the fabric and the presser foot to stop it sticking, then gently peel it away from the seams after sewing. As with any new fabric, sew a test swatch on a double scrap of fabric before tackling your project to see how it behaves. If your fabric is on the heavier side, or if you’re finding the seams are puckering, try lengthening the stitch slightly to 3mm to 3.5mm. If you find your stitches are skipping, switch to a fresh, sharp needle (see above). If you want to make your raincoat as water resistant as possible, you could seal the seams to prevent water seeping through. 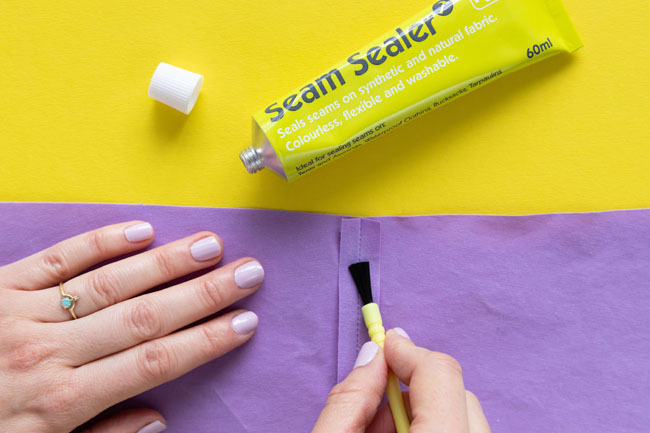 You can buy seam-sealing adhesives, such as paint-on glue or iron-on tape, which you apply to the wrong side of the garment along the seams before crossing the seam or attaching the lining. 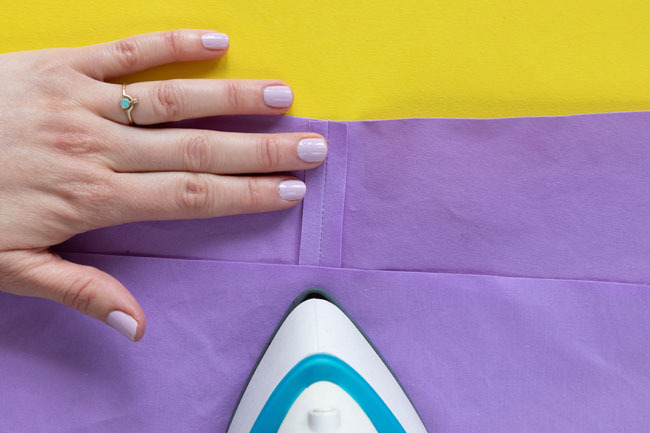 If you use the iron-on variety, make sure your fabric is able to withstand the heat of the iron, and be sure to use a pressing cloth to stop it sticking to your iron! If your fabric is on the lighter-weight side, you could sew the garment with French seams as an alternative – or in addition! – to using a seam sealant. As they’re sewn twice, they’ll make it extra hard for water to get through the seams. Alternatively, if you have an overlocker (serger), finishing the seam allowances together with a four thread overlock stitch will also help create a robust finish. French seams and overlocking seam allowances together will create extra bulk though, so avoid them on heavier fabrics. It’s always wise to test press a swatch of fabric before wielding the iron on your precious sewing project, and this is particularly important with rainwear fabrics. The heat from the iron can damage some materials, particularly those that are coated or made with synthetic substances. Keep pressing to a minimum – or avoid it altogether if you’re working with something like PVC. You can finger press the seam allowances as you go along instead of using your iron. And, if you want a guideline for creating a neat fold, such as when turning up a hem, you could sew a row of staystitching and finger press the fabric up along this line. If you do use the iron, keep the heat setting as low as you can get away with and turn off the steam. Use some kind of pressing cloth to protect the fabric from direct contact with the plate of the iron. A scrap of the same fabric can work well. 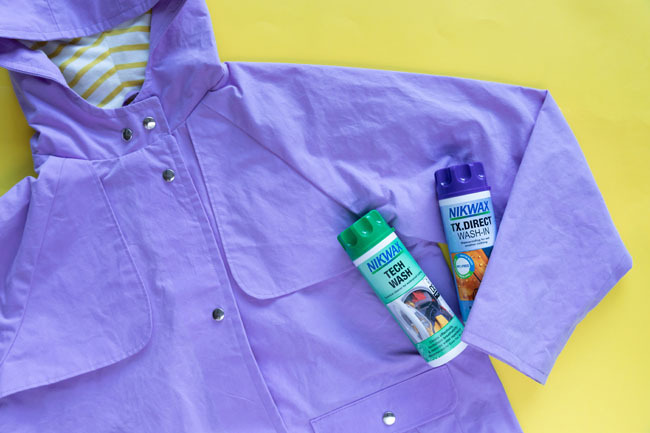 If your fabric is washable and you want to launder your finished coat, try using soap flakes, non-biological detergent, or a specialist cleaner for water repellent fabrics, such as Nikwax Tech Wash. You can also use a wash-in or spray-on waterproofer on some fabrics to restore their water-repelling properties. Hooray! 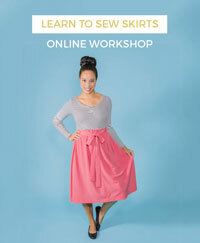 And finally, please don’t feel overwhelmed by the technical aspects of sewing with rainwear fabrics. 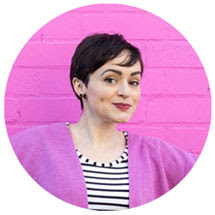 As with anything you make yourself, be mindful that you enjoy the process, consider any mistakes part of your development as a DIY dressmaker, and feel suitably smug once you’ve finished and are wearing your beautiful handmade raincoat out and about. You made that yourself? Wowzers!